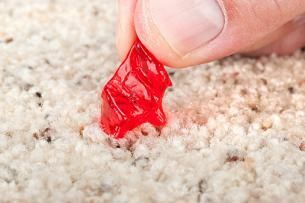 How to get gum out of carpet!! Let’s start with one of the easiest methods: ice! Just about every household has ice on hand and if you want to know how to get gum out of carpet, start by simply pressing ice against the gum. The gum will become hard and brittle, making it easy for you to scrape it off with a butter knife or fork. If you ever got gum stuck in your hair as a child, you probably remember the classic remedy: peanut butter. This pantry staple works on gum stuck in carpet as well. Just press and rub about 1 teaspoon of peanut butter onto the gum. Remove with a damp washcloth. If a little residue is left behind, remove it with a washcloth and soap and water. Peanut butter works because it’s oily, so you can imagine why olive oil and vegetable oil are good alternatives. Apply a teaspoon of oil and pick out the gum with your fingers. The oil will reduce the gum’s stickiness. It can, however, stain your carpet, so don’t use this method unless you’re desperate and have no other options. Also be sure to clean it out thoroughly afterward using a carpet cleaning product and a vacuum. Spray on a small amount of WD-40 spray and work it in with your fingers until you can pull off the gum. Afterward, clean off the WD-40 spray with a dish detergent and a moist washcloth. It is very important that you thoroughly remove the WD-40, however, because it is very flammable. 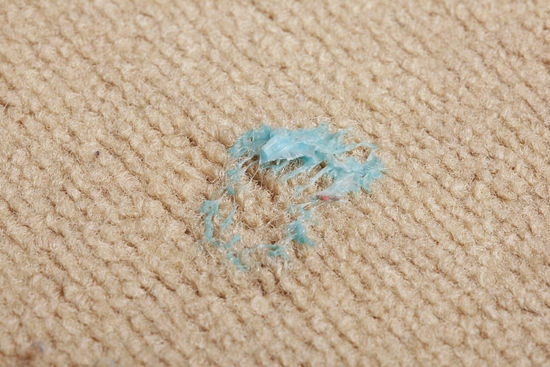 For that reason, WD-40 should not be your preferred method when deciding how to get gum out of carpet. Goo Gone works well too, but because you’re less likely to have it around the house, it costs more, and other methods work just as well, we’ve listed it last. Goo Gone will remove the stickiness and allow you to remove the gum with a moist cloth.